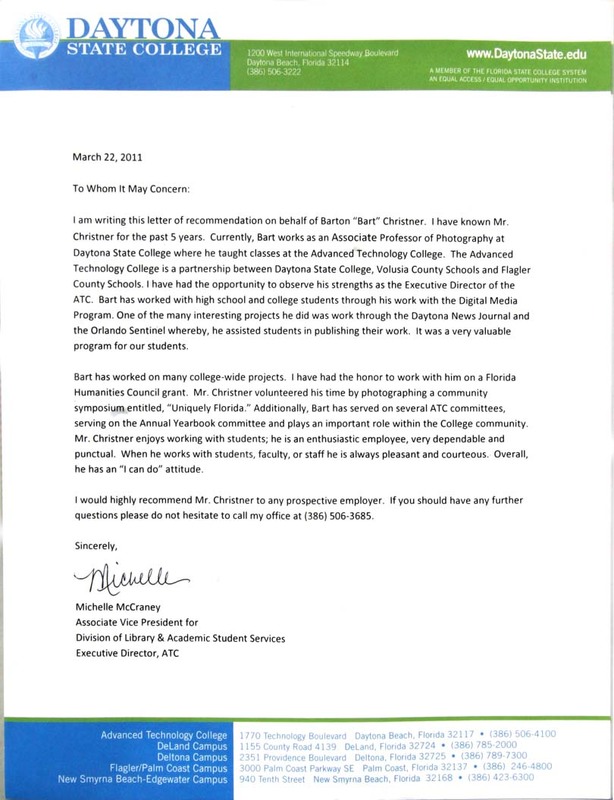 I am writing this letter of recommendation on behalf of Barton "Bart" Christner. I have known Mr. Christner for the past 5 years. Currently, Bart works as an Associate Professor of Photography at Daytona State College where he taught classes at the Advanced Technology College. The Advanced Technology College is a partnership between Daytona State College, Volusia County Schools and Flagler County Schools. I have had the opportunity to observe his strengths as the Executive Director of the ATC. Bart has worked with high school and college students through his work with the Digital Media Program. One of the many interesting projects he did was work through the Daytona News Journal and the Orlando Sentinel whereby, he assisted students in publishing their work. It was a very valuable program for our students. Bart has worked on many college-wide projects. I have the honor to work with him on a Florida Humanities Council grant. Mr. Christner volunteered his time by photographing a community symposium entitled, "Uniquely Florida." Additionally, Bart has served on several ATC committes, serving on the Annual Yearbook committee and plays an important role within the college community. Mr. Christner enjoys working with students; he is an enthusiastic employee, very dependable and punctual. When he works with students, faculty, or staff he is always pleasant and courteous. Overall, he has an "I can do" atitude. I would highly recommend Mr. Christner to any prospective employer. If you should have any further questions please do not hesitate to call my office.